Stephanie McPherson is an open book – friendly, trustworthy and positive. She is a graduate of Oakland University with a BBA in Marketing. 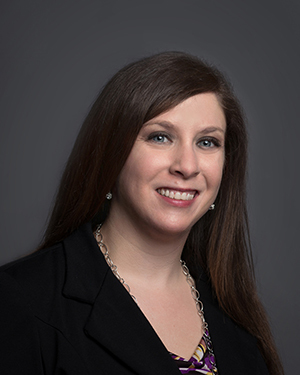 Joining ASG in 2004, Stephanie worked hard to earn her current role as Marketing Director. Despite the Director title, she wears many hats – also serving as a marketing guru, event planner and support person. Stephanie looks after all of ASG’s marketing needs – email, website, social media, publications, association involvement and more. If it has the ASG name on it, you can bet that Stephanie was involved in making it happen. When she’s not anchoring ASG activities, Stephanie enjoys time with her husband, her two young kids and her rescue lab retriever. The entire McPherson crew loves to binge-watch Grey’s Anatomy or Game of Thrones. On the weekends, you will find her enjoying a bottle of wine with her friends or during the summer, spending time up at the family lake house. Stephanie is aware and thankful that she has a good life, but she still has a diverse bucket list. She’d love to be able to take a houseboat trip with friends on Lake Powell for a while, and she wants to hula dance on the gorgeous beaches of the Hawaiian islands. She also dreams of winning big as a contestant on Wheel of Fortune.